Beyond the headlines of war, a good thing is happening. Some may have noticed that lonely Myanmar, aka Burma, has turned and reached out to the West. It has installed ATMs, freed opposition leaders, voted a parliament and now is even talking to Hillary Clinton. To those who’ve seen the country only five years ago this is nothing less than a miracle. Five years ago Burma was oppressed into a 18th century time warp from which even Sri Lanka, Pakistan or Cambodia seemed like beacons of freedom and prosperity. I was arrested for simply looking (with binoculars) over the lake to the house where Aung San, the daughter of Burma’s founder, was locked up for 15 years. 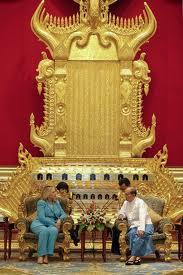 Aung San now runs for parliament and meets Hillary! Those days, $50 would get you three kilo of Kyat notes with which you could buy, well, nothing really because nobody wanted it. There were no telephones, no internet, no newspaper, no ice-cream, no healthcare, and no credit-cards – it was perfectly medieval. Thanks Hillary, for going there. I am sure the trip wasn’t easy, but you will have recognized the beauty and authentic goodness of its people. 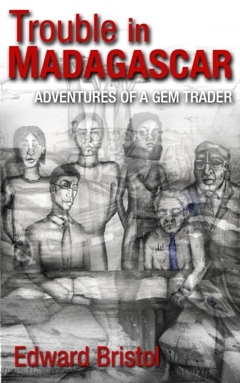 Probably you haven’t seen their terrific gemstones but we here all love them and, please, please, let us again buy and sell them legally. If you do, we promise to be very good, pay taxes and all.